With the second floor pretty much framed up, the guys moved on to the roof. Here's the old roof, after they tore the back of it off. This is more light than we have ever seen in here, and more than we will ever see, because there won't be any windows in the attic when we are done (but there will be fluorescent lights, which we have not had before). One thing you can see is the sort of marginal way the front bay roof is framed up. 1876 was still in the transitional period of construction, between the old timber-framed style of building and modern light frame wood construction. So a lot of things are kind of stuck together in a mix of the two styles. 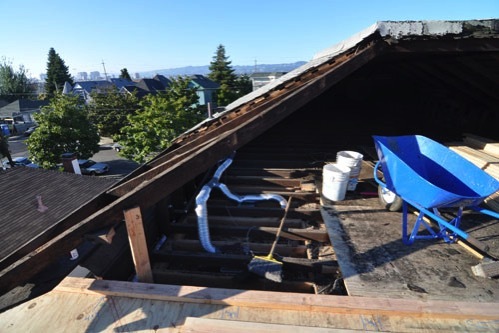 In the case of the front bay, they didn't quite know how to frame the bump-out for the front bay, so they didn't; they just framed the hip roof behind it, then built the bay on top of that. A waste of wood, but wood was not as precious a resource then as it is now. And here's where the old roof will transition to the new. The new attic space is just the footprint of the back of the house. With some slightly more modern framing details. 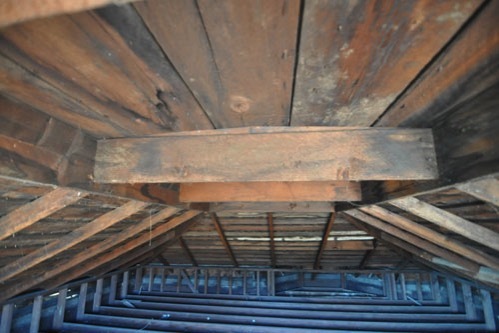 The first thing to go in was the attic floor. 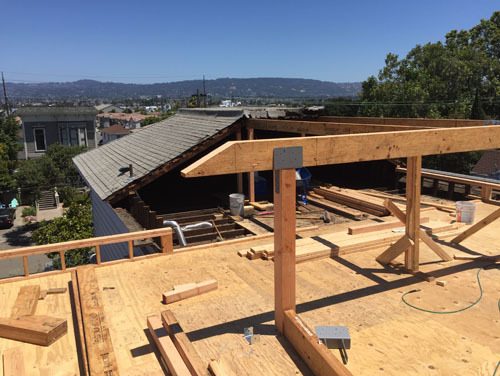 In modern wood construction we usually do platform framing, which means we build a wall, then a ceiling/floor over it, then the next wall. That gives you a place to stand as you build the upper stories. In the attic that wall is just a small not even knee-high wall that holds ornament on the upper part of the house. 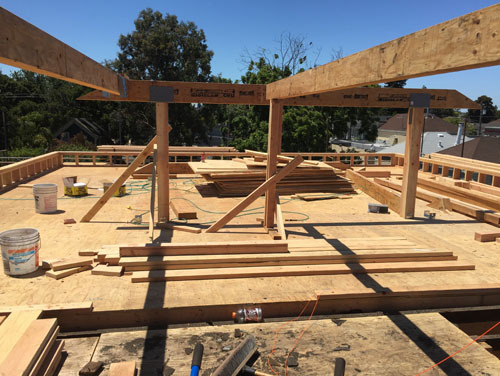 This view shows you the difference in the scale of the framing for the new part of the house. You see that step up there? (It's at the bottom of the picture.) 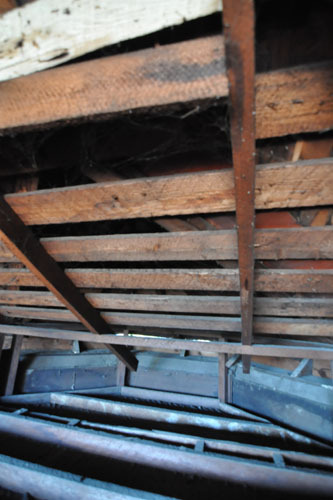 That's the difference in size between the ceiling joists of the old construction and the new. The attic is quite large and has a fairly high ceiling, so a couple of people have asked me if we planned to use that space for anything. We do not, except some light storage (we have an artificial Christmas tree which we will probably keep up there), mostly because doing anything more with the space would a) be very expensive for code reasons because 4-story houses are not allowed in this neighborhood and the basement counts as a story, b) require massive interior changes because the ceiling height is not legal for habitable space in most of the attic, c) be super complicated because of the under-sized floor in the front of the attic thanks to existing construction, and most important, d) we don't need the space because we have plenty in the rest of the house, so developing more space just because we can is foolish. So the attic is going to be utility space only. We are putting in central air conditioning which will be housed there (one way to make air conditioning more efficient is to have the compressor and ducts inside the conditioned space), and the rest will just be open area under the roof where we can put seasonal things that are small and light enough to get up the attic stairs.